Statistics Canada's Physical Flow Accounts for greenhouse gas (GHG) emissions are now available at the provincial/territorial level for the first time. These data are presented to reflect the activities of industries, households and governments, and follow the classification system of industries and commodities used in Statistics Canada's supply and use tables. This allows the integration of GHG emissions with economic statistics. Environment and Climate Change Canada is responsible for producing Canada's National Inventory Report on Greenhouse Gas Sources and Sinks (NIR). This inventory fulfills Canada's reporting obligations under the United Nations Framework Convention on Climate Change (UNFCCC), and is the official benchmark for GHG emissions in Canada. 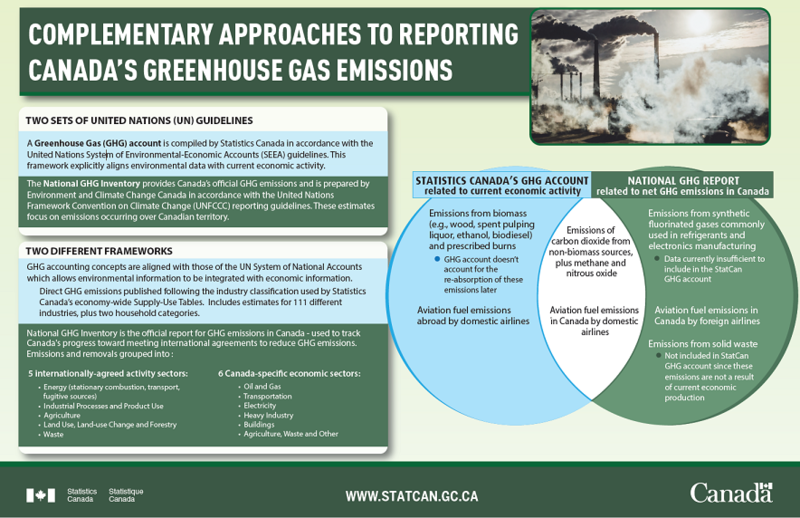 Despite drawing from common sources, the estimates in Statistics Canada's GHG emissions account differ from those reported in the NIR. This is due to the reporting requirements of the UNFCCC differing from the methodological guidelines of the United Nations System of Environmental–Economic Accounting used to create the GHG account described here. The sector definitions of the NIR also differ from those of the Physical Flow Accounts and therefore should not be directly compared. Alberta's oil and gas extraction industry emitted the equivalent of 118 megatonnes of carbon dioxide, up 28.7% from 2009 to 2016, and contributed significantly to Alberta producing the most GHG emissions in Canada. Meanwhile, households accounted for approximately one-third of emissions in Ontario and Quebec, the largest source of direct GHG emissions in both provinces. Biomass consumption in wood product manufacturing and pulp, paper and paperboard mills (15.6%) accounted for almost one-sixth of GHG emissions in British Columbia, making it the largest source of emissions outside of households (20.4%). In Saskatchewan, oil and gas extraction (26.5%), crop and animal production (25.7%) and electric power generation (21.4%) accounted for almost three-quarters of total GHG emissions in the province. Since 2009, Newfoundland and Labrador saw a near doubling of emissions coming from electric power generation, transmission and distribution (+94.7%), along with a 40.9% increase in households' transportation emissions from 2009 to 2016. Conversely, emissions from electric power generation, transmission and distribution in Nova Scotia (-35.8%) and New Brunswick (-30.6%) were down. In Ontario, emissions were down by almost two-thirds as a result of the phase-out of coal in electric power generation, transmission and distribution. This decline more than offset the overall increase across the rest of Ontario's industries and households, resulting in a 2.8% decrease in total GHG emissions in the province from 2009 to 2016. Household emissions per capita represent the average amount of GHG emissions directly generated by one person for final consumption activities that occur within the household sector. Examples of final consumption include the emissions from motor gasoline required by households to drive their car, and from natural gas to heat their homes. A region's available fuel mix, climate, average household size and household incomes are among some of the factors that influence per capita emissions. British Columbia (3.2 tonnes) produced the lowest per capita household GHG emissions among the provinces in 2016. Manitoba (3.4 tonnes), Ontario (3.7 tonnes) and Quebec (3.8 tonnes) were also all below the national per capita level (3.9 tonnes). Statistics Canada's Physical Flow Accounts (PFA) record the annual flows of selected natural resources, products and residuals between the Canadian economy and the environment. As such, data are presented to reflect the activities of industries, households and governments, and follow the classification system of industries and commodities used in Statistics Canada's supply and use tables. Environment and Climate Change Canada is responsible for producing Canada's National Inventory Report on Greenhouse Gas Sources and Sinks (NIR). This inventory fulfills Canada's reporting obligations under the United Nations Framework Convention on Climate Change (UNFCCC), and is the official benchmark for greenhouse gas (GHG) emissions in Canada. 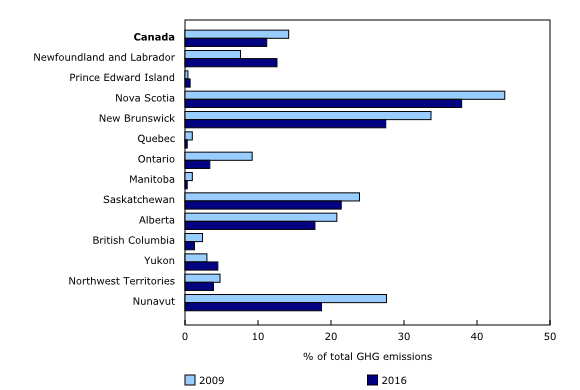 Despite drawing from common sources, the estimates in Statistics Canada's GHG emissions account differ from those reported in the NIR. This is due to the reporting requirements of the UNFCCC differing from the methodological guidelines of the United Nations System of Environmental–Economic Accounting used to create the GHG account described here. The sector definitions of the NIR also differ from those of the PFA and therefore should not be directly compared. For more information on the methodological differences, see the physical flow accounts metadata page (5115). Preliminary data for 2009 to 2016 from the PFA are now available for provincial and territorial GHG emissions (38-10-0097). 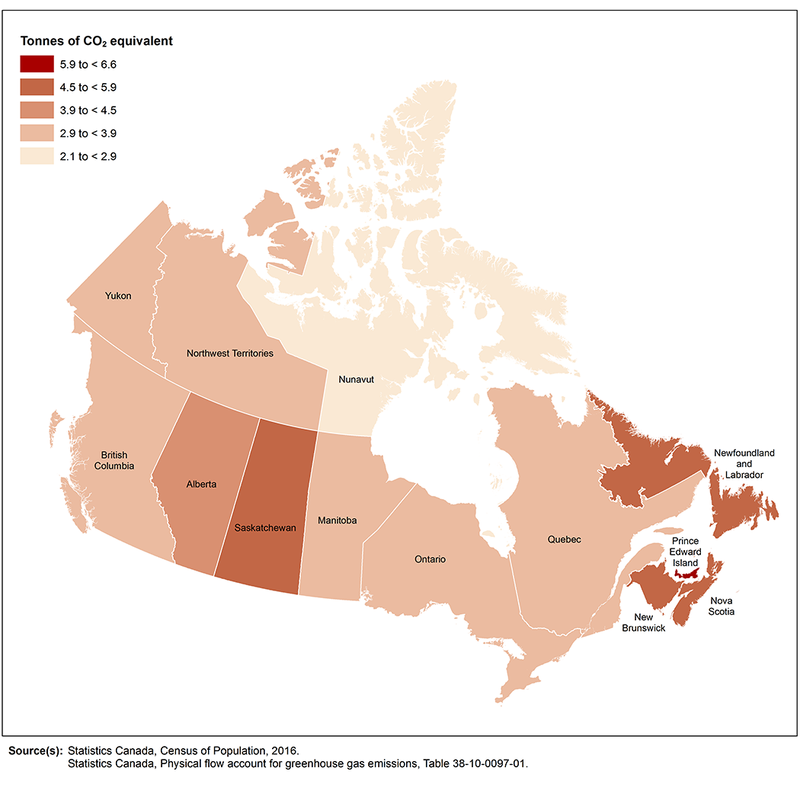 National estimates for 2009 to 2016 GHG emissions were updated based on changes to source data, and to reflect revisions to the methodology for compiling the GHG account, most significant of which was compiling the data at the provincial/territorial level prior to aggregating to the national estimates presented. Estimates of energy use (38-10-0096) and GHG emissions (38-10-0097) for 2015 and 2016 were revised following the release of the 2015 supply and use tables (36-10-0478). Estimates for 2013 energy use were updated to reflect a revision to source data.